United Way has put a stake in the ground on education. Our goal is to cut the number of high school dropouts in half by 2018. It’s an ambitious goal. This year, 1.2 million high school seniors will not graduate. That means 6,000 students will drop out today. The numbers are even grimmer for young people of color. Every parent’s dream is for our children to succeed – and for their success to surpass ours. But today’s young Americans are less likely to earn a diploma than their parents, a distinction not shared by any other industrialized country. United Way wants to change that reality, and boost every child’s chance for success in school, work and life. Our core strengths – a national network, committed partners and public engagement capacity – position us well to activate this social change movement. A capacity to move communities to make a difference. Much of the United Way system is already engaged in education work – especially early childhood education and increasing high school graduation rates. But our 10-year education goal cannot be achieved by focusing on high school alone, or by starting in the 9th grade or only doing early childhood work. High school dropouts are 12 years in the making, usually starting school behind. 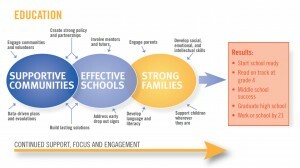 So tackling the education challenge requires reframing education on a birth to 21 continuum. The five focus areas United Way works in are a way to organize the work and build strategies in light of the birth to 21 continuum. But what matters most is individual involvement. 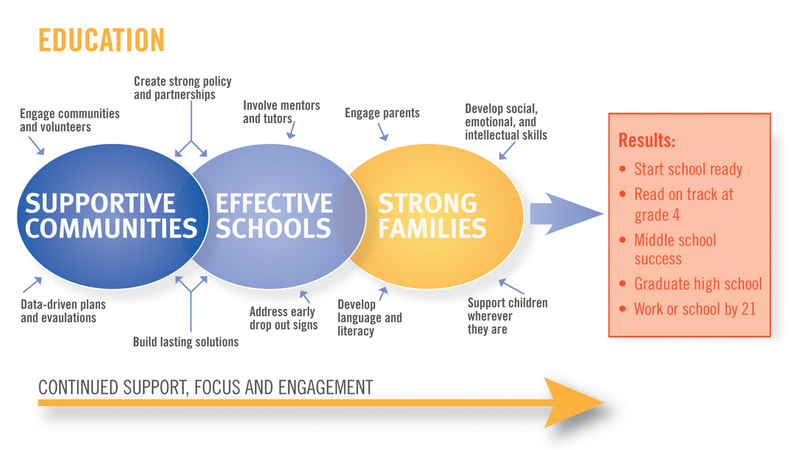 Research shows the strategies proven to work are those that connect communities to their schools: parent involvement; literacy volunteers in the classroom; mentors for disadvantaged students; business leaders engaged in early childhood advocacy.